This study was conducted to question the socio-economic and educational status of preschool 4-6-years old children and their families living in Bitlis and its counties; and also, to examine the effects of these variables on the nutrition and physical development status of children. A total of 960 students, 479 boys and 481 girls, aged between 4-6, who were attending preschools in Bitlis and its counties were included in the study. There was a significant difference (P<0.05) between the BMI values ​​of the children and the educational status of their parents; however, there was a very weak correlation between these values ​​(mother (r=0.163), father (r=0.121. When the total daily sleep durations and the BMIs of the children were compared, it was determined that there was a significant difference (P<0.05) and a relation at a moderate severity (r=0.54). It was determined that the nutrition and physical development status of the children was related with the socio-economic and educational levels of the parents with a weak correlation and with a positive and very high correlation with the consumption of some food groups. Acharya, J., van Teijlingen, E., Murphy, J., Hind, M. (2015). Study on nutritional problems in preschool aged children of Kaski district of Nepal. Journal of Multidisciplinary Research in Healthcare, 1(2), 97-118. Aksoy, A., Selen, H. (2018). The evaluation of body composition and anthropometric measurements of males aged 18-25 years, based on the regularity of physical exercise. Progress in Nutrition, 20(3), 338-343. Aksoy, A., Selen, H., Ozdemir, F.A., Bulut Arıkan, F. (2017). Association of physical activity and obesity status for individuals between the ages of 18-30 via bioelectrical impedance analysis device and metabolic holter measurements. Progress in Nutrition, 19(4), 391-397. Aktaş, N., Angın, D.E. (2011). Nutrition education and food services in preschool education institution: spain and turkey. Revista Espanola de Nutricion Comunitaria-Spanish Journal of Community Nutrition, 17(1), 6-12. Al-Bashtawy, M. (2017). Breakfast eating habits among schoolchildren. Journal of Pediatric Nursing, 36, 118-123. American Academy of Pediatrics (AAP). 2018. About Childhood Obesity. Institute for Healthly Childhood Weight. http://www.aap.org/obesity/about.html (accessed 13.08.2018). Angın, E., Aktaş, N., Cebirbay, M.A. (2015). A nutrition guide for early childhood active stakeholders. INES Uluslararası Eğitim Bilimleri Dergisi, 2(4), 419-426. Auestad, N., Hurley, J.S., Fulgoni, V.L. Schweitzer, C.M. (2015). Contribution of food groups to energy and nutrient intakes in five developed countries. Nutrients, 7(6), 4593-618. Demirtaş, B. (2008). Doğu ve güneydoğu anadolu bölgelerinde eğitim ve öğretim (1923-1938). Atatürk Yolu Dergisi, 41, 63-87. Ekinci, G.M. (2018). Okul öncesi çocuklarda beslenme. Ekonomi ve KültürAyrıntı Dergisi, 5(59), 27. Erkan, S., Akyol, T. (2017). A study on the views of preschool teachers and teacher candidates about the concepts of learning and participation. Educational Research and Reviews, 12(6), 373-379. Essah, E.A., Ofetotse, E.L. (2014). Energy supply, consumption and access dynamics in botswana. Sustainable Cities and Society, 12, 76-¬84. Forno, E., Han, Y.Y., Libman I.M., Muzumdar, R.H., Celedon, J.C. (2018). Adiposity and asthma in a nationwide study of children and adults in the United States. Annals of the American Thoracic Society, 15(3), 322-330. Garipağaoğlu, M., Özgüneş, N. (2008). Okullarda beslenme uygulamaları. Çocuk Dergisi, 8(3), 152-159. Hashemian-Nejad, N., Pejhan, A., Rakhshani, M.H., Hoseini, BL. (2014). The incidence of low birth weight (LBW) and small-forgestational age (SGA) and its related factors in neonates, sabzevar, Iran. International Journal of Pediatrics (Supplement 6), 2(4), 73-78. Hwalla, N., Al Dhaheri, A.S., Radwan, H., Alfawaz, H.A., Fouda, M.A., Al-Daghri, N.M., Zaghloul, S., Blumberg, J.B. (2017). The prevalence of micronutrient deficiencies and inadequacies in the middle east and approaches to interventions. Nutrients, 9(3), E229. Işık, H., Dağhan, Ş., Gökmen, S. (2013). Gıda endüstrisinde kullanılan yenilebilir kaplamalar üzerine bir araştırma. Gıda Teknolojileri Elektronik Dergisi, 8(1), 26-35. Kazak, A.E., Schneider, S., Didonato, S., Pai, A.L. (2015). Family psychosocial risk screening guided by the pediatric psychosocial preventative health model (PPPHM) using the psychosocial assessment tool (PAT). Acta Oncologica, 54(5), 574-80. Kıralan, M., Yorulmaz, A., Ercoşkun, H. (2005). Trans yağ asitler, kaynakları ve insan sağlığı üzerine etkileri. Gıda ve Yem Bilimi Teknolojisi, 7, 52-64. Kimm, S.Y., Obarzanek, E., Barton, B.A., Aston, C.E., Similo, S.L., Morrison, J.A., Sabry, Z.I., Schreiber, G.B., McMahon, R.P. (1996). Race, socioeconomic status, and obesity in 9- to 10- year-old girls: the NHLBI growth and health study. Annals of Epidemiology, 6, 266-75. Kondolot, M., Balcı, E., Öztürk, A., Mazıcıoğlu, M.M., Hatipoğlu, N., Kurtoğlu, S., Üstünbaş, B.H. (2011). Body mass index percentiles for turkish children aged 0-84 months. Annals of Human Biology, 38(6), 676-680. Ogden, C.L., Carroll, M.D., Kit, B.K. (2014). Prevalence of childhood and adult obesity in the United States, 2011-2. Journal of the American Medical Association, 311(8), 806-814. Özmert, E.N., Yurdakök, K., Soysal, S, Kayıkçı, M.E., Belgin, E., Özmert, E., Laleli, Y., Saraçbası, O. (2005). Relationship between physical, environmental and sociodemographic factors and school performance in primary school children. Journal of Tropical Pediatrics, 51(1), 25-32. Prado, E.L., Dewey, K.G. (2014). Nutrition and brain development in early life. Nutrition Reviews, 72(4), 267-284. Rowe, M.L., Denmark, N., Harden, B.J., Stapleton, L.M. (2016). The role of parent education and parenting knowledge in children's language and literacy skills among white, black, and latino families. Infant and Child Development, 25(2), 198-220. Sancak, R., Dündar, C., Totan, M., Çakır, M., Sunter, T., Küçüködük, Ş. (1999). Ortaokul ve lise öğrencilerinde obezite prevalansi ve predispozan faktörler. Ondokuz Mayıs Üniversitesi Tıp Dergisi, 16(1), 19-24. SEGE (2013). İllerin ve Bölgelerin Sosyo-Ekonomik Gelişmişlik Sıralaması. Kalkınma Bakanlığı, Bölgesel Gelişme ve Yapısal Uyum Genel Müdürlüğü SEGE-2011 (p. 50), Ankara. Shloim, N., Edelson, L.R., Martin, N., Hetherington, M.M. (2015). Parenting styles, feeding styles, feeding practices, and weight status in 4-12 year-old children: a systematic review of the literature. Frontiers in Psychology, 14(6), 18-49. Sisson, S.B., Kiger, A.C., Anundson, K.C., Rasbold, A.H., Krampe, M., Campbell, J., DeGrace, B., Hoffman, L. (2017). Differences in preschool-age children's dietary intake between meals consumed at childcare and at home. Preventive Medicine Reports, 8(6), 33-37. Şavaşhan, Ç., Sarı, O., Aydoğan, Ü., Erdal, M. (2015). İlköğretim çağındakı çocuklarda obezite prevalansinin belirlenmesi ve risk faktörlerinin araştırılması. Türkiye Aile Hekimliği Dergisi, 19(1), 2-9. Tam, A.A., Çakır, B. (2012). Birinci basamakta obeziteye yaklaşım. Ankara Medical Journal, 12(1), 37-41. TBSA. (2010). Türkiye Beslenme ve Sağlık Araştırması. (p, 139-144), Ankara. http://ekutuphane.sagem.gov.tr/kitaplar/turkiye_beslenme_ve_saglik_arastirmasi_(tbsa)_2010_saha_uygulamasi_el_kitabi.pdf (accessed 25.07.2018). TÜBER (2015). Türkiye Beslenme Rehberi. T.C. Sağlık Bakanlığı, Halk Sağlığı Kurumu, Basım: Kayhan Ajans. Ankara 2016, ISBN: 978-975-590-608-9. Uauy, R., Kain, J., Mericq, V., Rojas, J., Corvalán, C. (2008). Nutrition, child growth, and chronic disease prevention. Annals of Medicine, 40(1), 11-20. Ulutaş, A.P., Atla, P., Say, Z.A., Sarı, E. (2014). Okul çağındaki 6-18 yaş arası obez çocuklarda obezite oluşumunu etkileyen faktörlerin araştırılması. Zeynep Kamil Tıp Bülteni, 45, 192-196. World Health Organization. (1995). Physical Status: The Use and Interpretation of Anthropometry. Technical Report Series 854, Geneva. ISBN:9241208546. http://www.who.int/childgrowth/publications/physcal_status/en/ (accesed 04.06.2018). World Health Organization. (2000). Obesity: Preventing and Managing the Global Epidemic. Technical Report Series 894, Geneva. 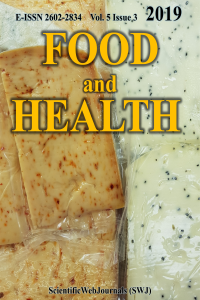 ISBN: 9241208945. http://www.who.int/nutrition/publications/obesity/WHO_TRS_894/en/ (accesed 04.06.2018). World Health Organization. (2006). Child Growth Standards. Length/height-for-age, weight-for-age, weight-for-length, weight-for-height and body mass index-for-age Methods and development. WHO Press, 1211 Geneva. http://www.who.int/childgrowth/standards/Technical_report.pdf (accesed 13.08.2018). Yalvaç, S., Erkan, T., Erginöz, E., Çullu, Ç.F., Kutlu, T. (2008). Bahçelievler çocuk yuvası 0-6 yaş grubunda beslenme durumunun değerlendirilmesi. Türk Pediatri Arşivi, 43, 89-93.